No matter how carefully I comb through review journals, there are always a few books I wish I had read in time to add them to our Best of the year list. This year was no exception. 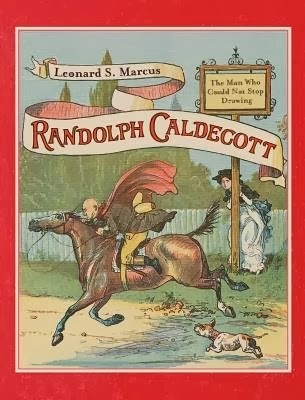 Historian and well-known book critic, Leonard Marcus, author of many titles that document some of the best movers and shakers in children’s literature, now offers readers a thoroughly readable and engaging biography of British illustrator, the man who invented the modern picture book, Randolph Caldecott. (1846-1886). Caldecott was born in Chester, England on March 22, 1846. A sickly child whose heart was damaged from rheumatic fever, he was tall, lanky, and good-looking, with blue-gray eyes and light brown hair that occasionally stood on end, he had a ready smile and easy-going manner and enjoyed poking fun at himself. Though he was formally educated and worked as a bank clerk, the young Caldecott always had a passion for drawing. A co-worker at the bank would later say of Caldecott, He came like a ray of sunlight into our life, and brightened the drudgery of our toil with his cheerful humour, and the playful sketches so easily done. Just as Caldecott’s illustrations encouraged readers to turn the page to see what came next, so is it with Marcus’ writing. We learn not only of Caldecott’s passion for his art, but Marcus explains how the advances in his world, for example the increase use of the steam engine and travel by train would influenced how Caldecott captured action, movement, and speed. The book’s design is also wonderful; it features extensive archival material and each page is abundant with sketches, paintings, and drawings some never before published. For most people, Caldecott is a familiar name, with Marcus' book, we can now know much about the man whose name has been forever linked with the best of the best in illustrations.